On Wednesday, the City Council approved a tax-increment financing deal for The 78 development in the South Loop by a vote of 31-14 as well as approved the much controversial Lincoln Yards TIF in a vote 32-13. Following the vote, Mayor Rahm Emanuel stated, “These are investments in the future that are not bound by the boundaries of the space. 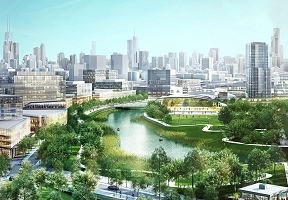 They will actually have dividends throughout the city of Chicago.” The City Council Finance Committee voted to approve a total of nearly $2.4 billion in tax-increment financing for the Lincoln Yards and The 78 projects. Sterling Bay and Related Midwest will give an additional $80 million to $400 million. Prior to the council vote, Mayor-elect Lori Lightfoot and a few grassroots organizations shared their opinion on Lincoln Yards and The 78 projects earlier this week.